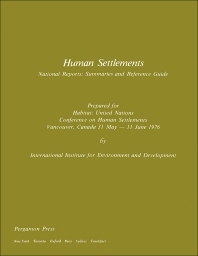 Human Settlements is a collection of government reports presented at HABITAT: United Nations Conference on Human Settlements held in Vancouver, Canada from May 31 to June 11, 1976. The reports describe human settlement issues of greatest concern to each government and consider solutions that may be successful. These issues include the threatening growth of the world's population, the grain to feed them, and the safe water to restore their health, as well as work to end unemployment and the gaps in income. This book is comprised of seven chapters and begins with an assessment of the policy framework within which nations approach human settlement decisions. Aspirations for the improvement of the quality of human life are discussed, along with objectives and goals to be attained through planning. The following chapters explore the experiences and promise of planning for human settlements in regional, metropolitan, and rural areas; the practical technological and policy problems in satisfying basic human requirements within settlements, with emphasis on shelter, infrastructure, and social services; the importance of land in human settlements; and the roles of public participation within the planning process for human settlements. The last chapter summarizes the possibilities and problems of solving human settlement problems through international cooperation and discusses various mechanisms which may be useful to the international community. This monograph will be a valuable resource for social scientists, social policymakers, human settlement planners, public officials, and citizens who are committed to the improvement of living conditions for all members of society.